Apple's Emergency SOS feature is designed to quickly get help to you when there is an emergency. 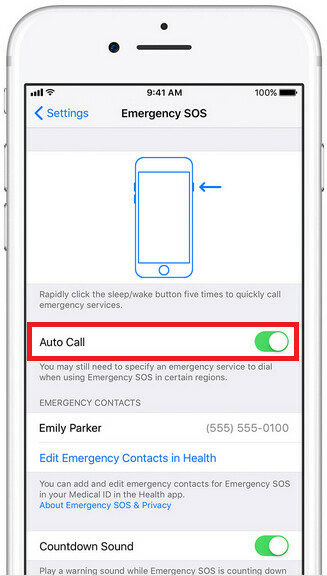 On the Apple iPhone 8, iPhone 8 Plus or iPhone X, hold the side button and one of the volume buttons at the same time, and you will see a slide bar that is used to activate the Emergency SOS protocol. That means a phone call is made to a local 911 dispatcher, and your emergency contacts are sent a text message that includes your current location. Those with an Apple iPhone 7 or older model can set off Emergency SOS by rapidly hitting the side button five times (three times in India). You still have to drag the slider to make the phone call to 911. On the Apple Watch, holding down the crown will set off an emergency call without requiring the user to drag a slider. This feature is available with iOS 11 and WatchOS 4. While this is a good system in theory, in real life Apple iPhone and Apple Watch users have been accidentally triggering the feature. For example, an Apple Watch wearer by the name of Jason Rowley, who uses his timepiece for its sleep tracking ability, accidentally pushed down the crown button on the watch while he was sleeping. This set off the Emergency SOS service, and at 1 am Rowley was awakened by three cops who had entered his bedroom in response to his accidental 911 call. The cops told Mr. Rowley that they had experience responding to calls triggered when Emergency SOS was set off unintentionally on the Apple Watch. Last month, we told you about an Apple repair shop that has been responsible for 20 false calls a day since October. The location repairs iPhone, iPad and Apple Watch units, and Apple acknowledged the problem at the time. If you are concerned about accidentally making an emergency call and finding yourself in the company of armed law enforcement, you can reduce the chance of an accidental 911 call by going to Settings > Emergency SOS to disable Autocall. This will add another slider that will have to be dragged before the Emergency SOS service is activated. i dont sleep with my apple watch. Afraid itll do a note 7 while im knocked out. Exactly. Also how is a watch going to tell you exactly how you sleep. My watch tells me to stand up all the time, even when I am driving. I have that same exactly issue. Watch tells me I stood up for another hour when I was sitting on my @zz the entire day. I accidentally called 911 while bench pressing at the gym. Loved explaining that one to the responder. It's a neat feature to have on a smartwatch, but come on, couldn't you make it the way it causes less harm than good? :'( It should save lives not to bother emergency line x times a day. I think you might be expecting a bit too much there from Apple. The idea was obviously to keep it simple, but simple usually means very prone to accidental use. A simple update can fix this, shouldn't be too big of a deal. I could never sleep with a watch on, that's not comfortable to me at all. Yeah, me either. Plus, most actual smartwatches aren't going to last a day, night and another day on battery. And even if they did, the following night is going to be spent on the charger. Only more basic ones will. Well most of the "basic" ones do 95+% of things you can do on a full featured, one day battery one. Good example is Xiaomi Huami Bip and Pebble in past.